DRY ROT ERADICATION SPECIALISTS, PEVENSEY. Home » DRY ROT ERADICATION SPECIALISTS, PEVENSEY. 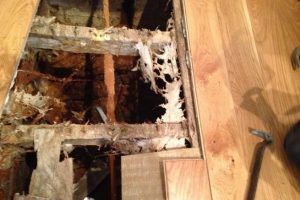 If you already live in or near Pevensey, Sussex or you are in the process of buying a property in this area and have noticed any of the following unusual things, don’t ignore them, you maybe seeing the first signs of the dreaded Dry Rot Fungus (Serpula lacrymans). Dry Rot and damp are one of the most highly destructive problems that can affect a property, they can cause major damage and devastation to wood and masonry, not to mention considerable disruption and expense to eradicate it. The only way to deal with this major wood rot problem is to stop the cause of the damp and immediately eradicate the dry rot attack. It is very important to call Tapco HomeDry as soon as possible to arrange a specialist timber & damp survey. Do any of the following seem familiar? • A smell of mushrooms, especially when you first walk into your property. • A fine rust/red dust on your furniture and surfaces. These are the spores being spread from the dry rot fruiting body. • Split joinery timbers that easily crumble in your hand. • A white cotton wool like growth on sub-floor timbers. This is called mycelium. • Unusually springy or warped floors. Unfortunately you may not initially notice any of the above signs of dry rot until it is too late, allowing it to go unnoticed and to spread rapidly through your property, causing severe structural damage and the need for thousands of pounds worth of repairs. 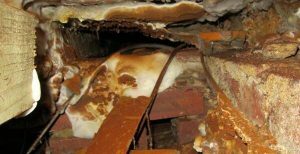 Each dry rot spore is capable of causing a brand new dry rot outbreak elsewhere in your property. The remedial work we carry out is very thorough. First we locate the exact cause of the cause (damp) and eradicate it. Wall plaster is remove and affected timbers are cut out to beyond the last visible sign of mycelium. The walls and remaining timbers are thoroughly treated, using high performance timber preservatives, prior to replacing the timbers with new pre-treated timber and re-plastering in accordance with our specification. Tapco HomeDry has been established and continuously trading since 1971 and has carried out many dry rot and damp surveys and restoration contracts on both domestic and commercial properties. We have the enviable reputation as being one of London and the Home Counties longest established and reputable dry rot, damp proofing, water damage and woodworm eradication experts. Our specialist dry rot and damp treatment has helped thousands of people to eradicate the problems from their properties once and for all. We use only the safest and best high performance timber preservatives and all plastering is carried out in accordance with our ‘Tapco HomeDry Dry Rot and Damp Proofing and Dry Rot re-plastering system’. Rising Damp eradication. The installation of a new damp proof course, specialist damp proof plastering and refixing joinery timbers. Lateral Damp Penetration. Structurally water proofing the walls below ground (Tanking). Basement Conversions. Water Proofing basements, cellars and vaults using a Cavity Drain Membrane Systems (CDM) or Tanking. Burst Pipe Water Damage restoration for you and your insurance company. Rain penetration. Carry out repairs and water proof plastering internally and repairing the cause. Condensation and Mould Control (Aspergillus app) using positive and passive ventilation systems. Dry Rot (Serpula lacrymans) eradication and restoration. Woodworm & Wood Rot eradication. Cracked Bricks and Cavity Wall Tie repair. Blocked Drains, CCTV camera surveys and structural resin lining. General property maintenance to stop damp. Call us first on 0800 195 9878 for a full dry rot and damp survey on your property. We are long term members of the Property Care Association (PCA) and Trust Mark (Government Endorsed Standards). We are all an accredited Which? Trusted Trader so Do It Once, Do It Right with Tapco HomeDry.